Is anyone actually finished with all their block sections? I’m not expecting anyone to say yes to that, unless that’s the only thing you did all week, day and night. That’s a lot of sewing! NOTE: I went back and added a bit of information to the last post, in the event you are making a two-color version of the quilt. Of the 142 blocks sections you’ll make, 80 of them should be one color (red in the diagram), and 62 should be the other color (yellow in the diagram). I should have clarified that earlier, but I think I’ve probably caught you in time! 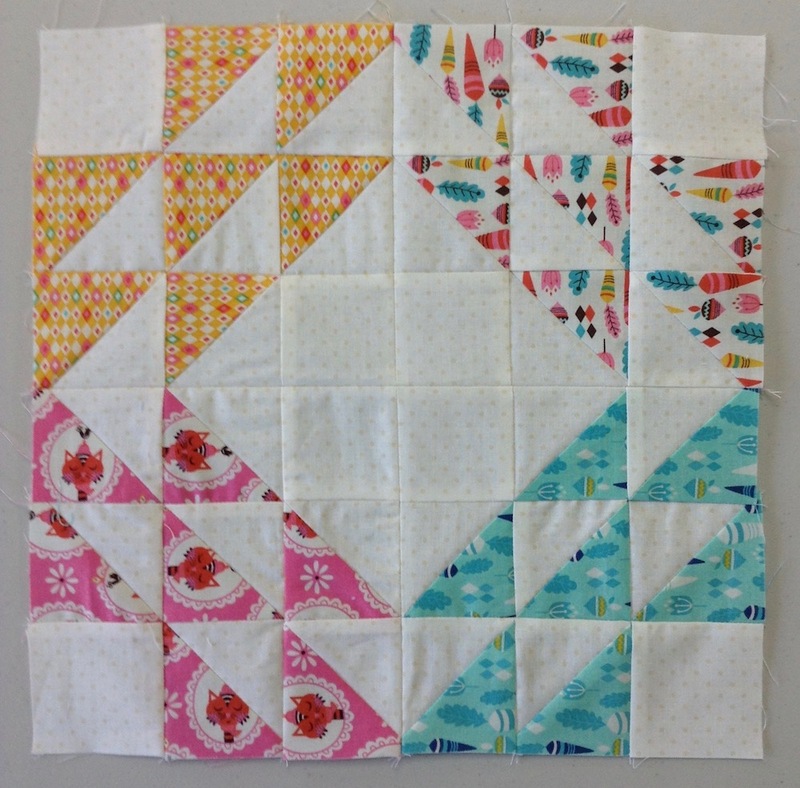 I’m back this week to go over how to assemble a block once you have all your sections made. Even though most of you probably aren’t near ready for this stage, I wanted to put it out here so that you’re not waiting on me when the time comes that you are ready. If you remember from the beginning, I said that I altered the assembly from the way the block appears in the book, so if you’re following along from the book, this is NOT the way it’s presented there. I did it this way so that we could mix up the sections better for an easier way to get a scrappy look. You don’t have to plan each block as carefully, and you can move the sections around if you need to. Each block takes four sections, and we’ll be making 32 blocks. This should mean that once you have all your blocks made, you will have 14 block sections left over. We’ll use these in the setting. So you’ll only be using 128 of your sections to make the blocks. If you want to have all your sections finished, and then arrange them on a design wall for the best layout, that’s fine. That’s pretty much what I did. I wanted my colors to be scattered evenly around on my finished quilt. For really scrappy blocks, this is not as important. They’ll look good no matter where they are in the quilt. If you’re itching to see what a complete block will look like, then you can go ahead and put a couple together just to see. Here’s how you do it . . . NOTE: If you are making a two-color version of this quilt, choose four block sections that are all the same color. Don’t forget, be sure and save 14 of your sections for the setting later on. You only need 32 blocks like this for the quilt. NOTE: If you are making a two-color version of the quilt, the 14 sections you save should be all one color (yellow in the diagram) — see the first note above. In other words, make all 80 of the first color into 20 blocks, then make 12 blocks from the second color, and save the remaining 14 sections of the second color for the setting. If you’re just finding us, you can click the links in the sidebar under Canning Season Quilt-Along to get started and join in. You’re not too far behind yet! I won’t post the next step until February 27th, so that gives you a couple weeks to keep working on half-square triangles, block sections, and blocks. I think that’ll keep you busy! I might entertain you with some other stuff in between, so check in if you take a notion! This is fun! If I’m using 9 blocks (36 sections) for the center of a baby quilt. How many additional sections will I need for setting later on? 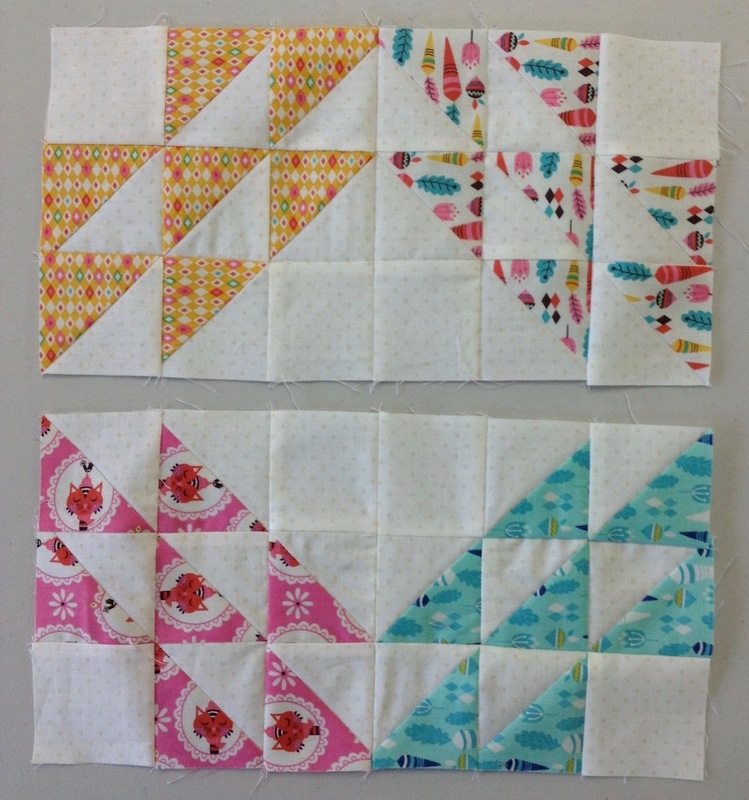 Well, I can’t say I made all my blocks, but I did get all my triangles sewn and trimmed! 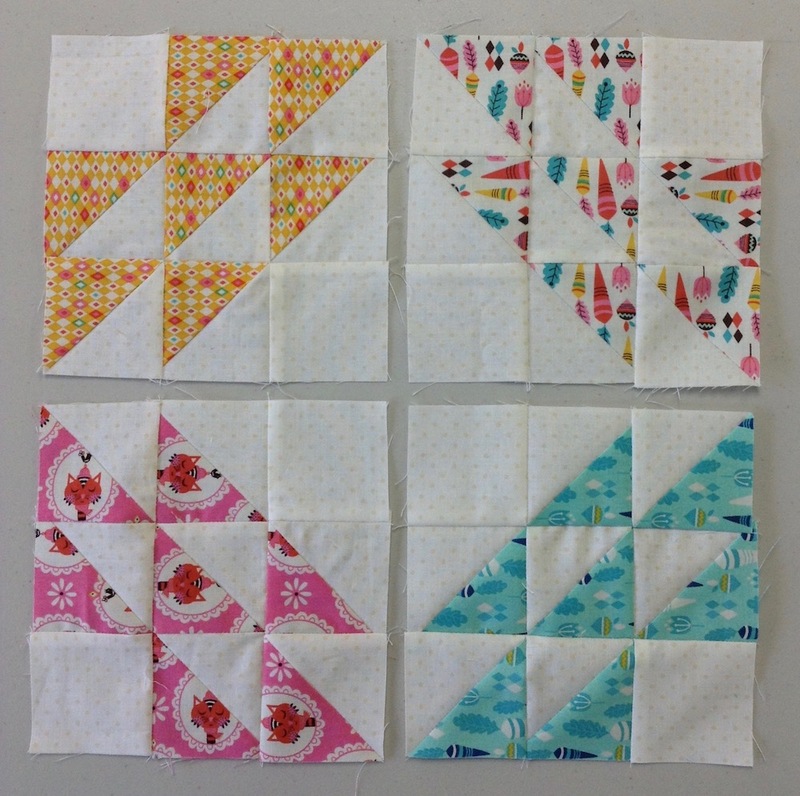 I completed 4 blocks because I just couldn’t stand it and had to sew them together to see how they’d look. Oh, I forgot to tell you, my half-square triangles are 1 1/2″. The blocks are like little jewels. I’m having so much fun!